Keratoconus or conical cornea is a non-inflammatory degenerative disease of the human eye which the normally round cornea becomes distorted and develops a cone-shaped prominence (ectasia). Keratoconus can cause substantial distortion of vision, with multiple images, streaking and sensitivity to light all often reported by patients. The progression of keratoconus is usually slow and can stop at any stage: from mild to severe. If the keratoconus progresses, the cornea bulges and thins, becoming irregular and sometimes forms scars. Keratoconus is the most common corneal dystrophy, affecting one person in a thousand; it seems to occur in populations worldwide, although some ethnic groups have a higher prevalence than others. It is usually diagnosed in young patients and presents it’s most severe in the second and third decade of life. People with early keratoconus typically report a small blur in their vision for driving and/or reading. In early stages, the symptoms of keratoconus may be the same as any other refractive defect the eye. As the disease progresses, vision deteriorates. Visual acuity becomes impaired at all distances and night vision is often quite poor. Some people have vision in one eye that is markedly worse than in the other eye. Some develop photophobia (sensitivity to bright light), eye strain by forcing the eyes while reading or itching in the eye. There is usually little or no sensation of pain. The classic symptom of keratoconus is the perception of multiple ghost images, known as monocular polyopia. Instead of seeing only one point, a person with keratoconus sees many images of that point, spread out in very irregular pattern. This pattern typically does not change every day, but does deteriorate as time goes on. Some patients also reported glare and halos around lights. The first sign of keratoconus is blurred vision at first can be corrected with eyeglasses. The thinning of the cornea progresses slowly over 5-10 years and then tends to stop. Occasionally it is rapidly progressive and advanced stages the patient may experience sudden blurred vision in one eye, due to the sudden entry of fluid into the cornea thinned. This improves with time, taking weeks or months to disappear. In advanced cases superficial scarring at the apex of the cornea resulting in further decrease in vision. One proposal suggests that keratoconus depends on a defect in the development and genetic (about 7% of patients have relatives with keratoconus). This suggests that the consequence of an abnormality in growth, essentially a birth defect. Another is that Keratoconus is a degenerative condition. A third postulated that keratoconus is secondary to other diseases. A less accepted theory suggests it may be of endocrine origin. The actual incidence of keratoconus is not known. It is one of the most common afflictions of the eye but it is by no means a rare disease. It’s estimated to occur once in every two thousand people. Usually the disease occurs in young people at puberty. 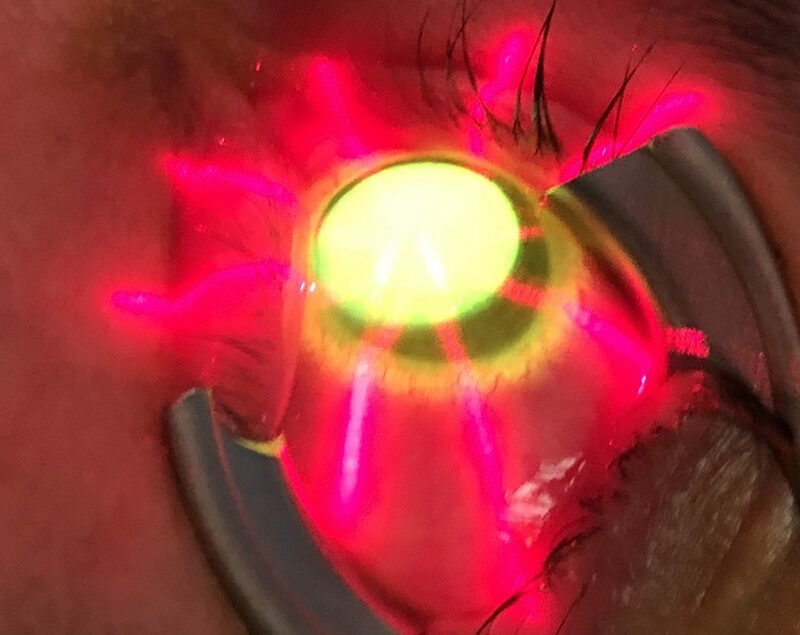 Several sources suggest that keratoconus probably arises from a number of different factors: genetic, environmental or cell phone, but no one can really determine what actually causes the disease. Also Itching of the eyes is another theory. This can cause thinning of the cornea due to mechanical removal of epithelial cells.